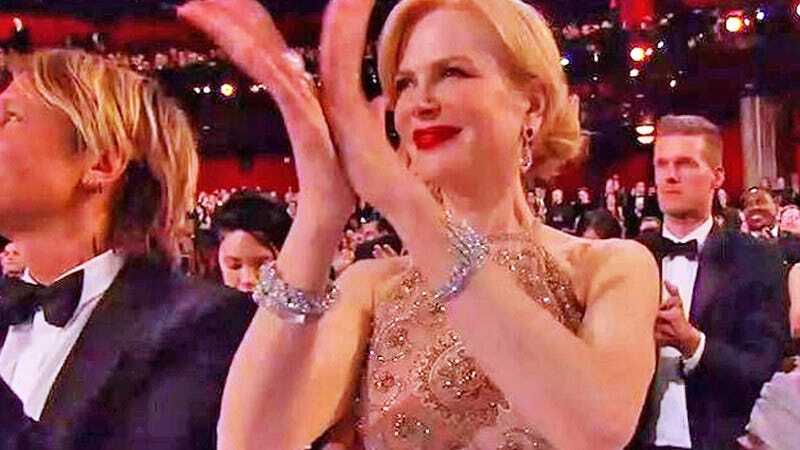 Nicole Kidman claps weird because of her jewelry, okay? A starstruck accountant for PricewaterhouseCoopers may have taken the blame for this year’s instantly infamous Oscars Best Picture screw-up, but, if we may, we’d like to present an alternate theory. What if the so-called “mistake” was actually an orchestrated event, designed to distract from the accidental reveal of evidence that the world is secretly run by an all-powerful cabal of shapeshifting reptilian aliens? Yes, we know, it sounds crazy. But how else do you explain Nicole Kidman’s weird hands? Much has been made of Kidman’s odd clapping at the ceremony, which was more like slapping her palms together than what we humans know as “clapping.” And Kidman has an explanation for that, telling Australian radio station KIIS FM that the reason she didn’t clap normally at the Oscars was because she wore some very expensive borrowed Harry Winston diamond rings to the ceremony, and she didn’t want to ruin them by letting her fingers make contact with each other. “It was really awkward,” she said. “I was like, ‘Gosh, I want to clap, I don’t want to not be clapping,’ which would be worse, right? ‘Why isn’t Nicole clapping?’” She adds, “I’m clapping but it was really difficult because I had a huge ring on that was not my own so it was absolutely gorgeous and I was terrified of damaging it.” And sure, companies lending millions of dollars in fine jewels out to celebrities to wear to awards ceremonies as advertising for their brands is common practice in Hollywood. But that doesn’t explain why her fingers are so damn long. One could say inhumanly long.